I noticed the first Japanese Beetles in our garden yesterday --- three shiny, metallic insects sitting on the top of our dwarf lemon tree. I've actually been looking forward to their arrival this year since I want to try out a new control technique I recently heard about. When the first Japanese Beetles emerge from their underground grub stage, they find a plant they like to eat and then emit congregation pheremones. 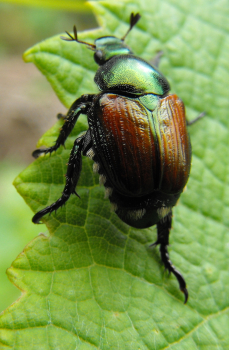 As other beetles emerge, they follow the scent to have a Japanese Beetle party. According to a few sources, all you have to do to protect your plants is be extremely vigilant at this time of year and handpick the first few beetles off the plants you like. The beetles you leave on nearby weeds will attract all of the newly emerging beetles to harmless beetle parties. Japanese Beetles are exremely easy to handpick in the morning when they're sluggish from the cold. Fill a cup partway up with water, hold it under the beetle, then tap the leaf slightly. Scared Japanese Beetles naturally let go of their perch and fall down, right into your cup. Once I've done my rounds, I toss water and beetles into the chicken tractors where the beetles are quickly consumed. I love the way that funnels the beetles straight to the chickens! I'm a bit leery of the pheremone part, though. I've read that the the Japanese Beetle lures actually attract more Japanese Beetles to your area than they trap, so the net effect is that you end up with more damage, rather than less.